On the far left is the site of the future Hotel Bentley that will be built in 1908. 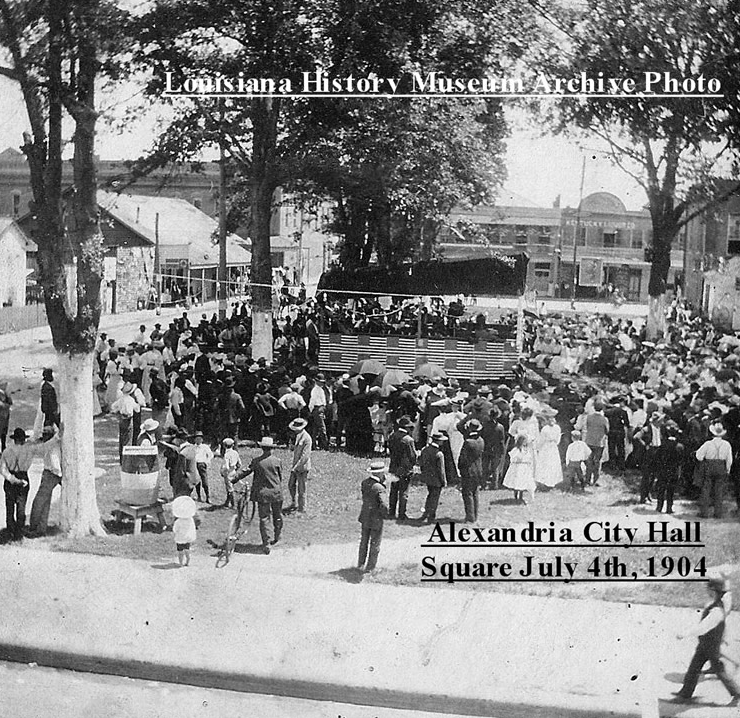 On the far right is the original City Hall, built before the Civil War in the 1850s and torn down in 1910, shortly after the beautiful old classic design City Hall was built. This is the only known photograph to exist of this historic square in its original configuration. The photograph also serves as a reminder of how often our Downtown has been “configured” and “re-configured” during the last 100 years, for better or worse. On a related note, I am also personally thankful to the countless professionals and community members who have contributed their time, energy, resources, and sound advice in the Downtown Hotels Initiative. During the last nine months, I have continued to be amazed by the world-class professionals who have taken an interest in our fair City, and I am anxious to have the details announced. That said, I am a little puzzled by some of the chatter on the Internet on this project. Even though none of the specifics have been revealed, some folks have already made up their minds: Somehow, this is a socialistic project, a project filled with kickbacks and sweetheart deals. Some folks are more content to blow smoke and kick up dirt than to actually have the patience to learn about the project they apparently criticize. It’s unfortunate, but perhaps not too surprising. And although it’s important to remain critical, it’s unproductive and, indeed, destructive to wholly-invent lies for the sole purpose of obstructing progress, job creation, and private-sector investment. For those more content to lie, the motivation has absolutely nothing to do with moving our City forward, and no, I am not referring to the claims of socialism; that’s an ideological position easy enough to dispute and disprove whenever the details are revealed. I am referring to those who lie simply for the sake of lying, and no where has this been more prevalent than on The Town Talk‘s forum. During the last few weeks, there’s been a noticeable uptick in politically-motivated lies on The Town Talk forum about Mayor Roy, the Downtown Hotels Initiative, and the Cleco case, and curiously and perhaps not coincidentally, many of these politically-motivated lies have been posted by newly-registered contributors. And these contributors have been brutal– recklessly and anonymously accusing people of illegal kickback schemes, substance abuse, infidelity, malfeasance, and ethics violations. None of this is true, of course. It’s shameless and defamatory, unfair and hateful attacks. And for anyone who truly pays attention, it’s easy enough to figure out where these particular, “anonymous” attacks are coming from. For anyone who follows The Town Talk forums, it should seem a little suspicious that these accusations and allegations, many of which were already definitively debunked years ago, would suddenly be published by a handful of “new” contributors, all at once and all during the month of November 2009. Just noticed this but find it interesting that the crowd seems to be about half white and half black. I don’t think that’s something you would have seen in many places at this time. Of course it does seem each group is keeping to one side of the photo or the other, but still nice to see that public events were truly public and not just for one group over the other. Thank’s first of all to Lamar!! Drew, back then..1904…we all.. other than the “segregation” issue, got along and attended events in harmony.